Rear Protection : rear bars and wheel carriers! Rear Protection: Designed to provide maximum protection for your vehicle’s tub! You’ve just made a big investment with the purchase of your new rig. Now it’s time to protect that investment with some new stylish rear protection products that we now supply & fit here at Midland Towbars! We have a range of various rear protection available for a wide range of Utes, 4WD’s and SUV’s. 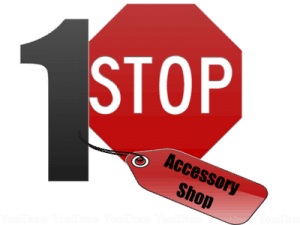 Not only can we supply and fit your new Rear Bar, but we can do the electricals as well – your 1 stop accessory shop! 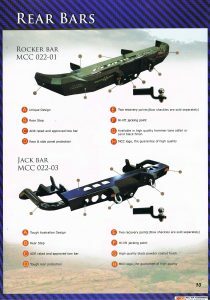 MCC have 3 styles of rear bars available: the stylish “Rocker Bar”, the tough looking “Jack Bar” which both provide maximum rear protection and the “MCC Rear Carrier Bar”. Rear Carriers are available in a wide range of combinations: Dual Wheel, Single Wheel and Jerry Can Arm with the option of single or double holder. 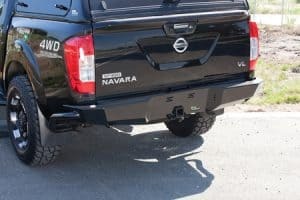 The Jack Bar and the Rocker Bar come standard with a towbar. Optional Towbar Packs are available for Rear Carrier Bars for the Ute range. The Ironman 4×4 Rear Protection towbar provides convenient high lift jack points, integrated tow hitch and maximum clearance all in a stylish package. It’s when approaching and departing rises in the terrain that the rear of your vehicle is especially susceptible to heavy bumps and damage. Rear protection bars offer the best possible protection to counter this. 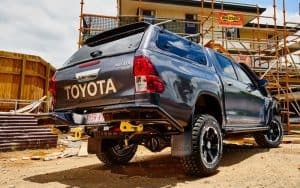 Not only can we offer a range of quality brands of rear bars some of them feature a compliant, ADR62 certified, class 4 heavy duty towbar rated to your vehicle’s towing capacity, like this TJM Hilux rear bar!